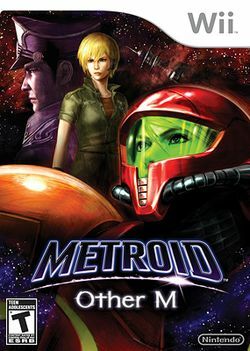 Metroid: Other M (メトロイド アザーエム, Metoroido Azā Emu?) is an action-adventure game for the Wii developed by "Project M", a team which consists of staff members from Nintendo, Team Ninja, and D-Rockets. A part of the Metroid series, it features gameplay in both first and third-person perspectives, and is the first installment of the franchise to feature melee attacks. Other M was released in North America on August 31, 2010, in Japan and Australia on September 2, 2010, and in Europe on September 3, 2010. Impressed with the 2004 action game Ninja Gaiden, series co-creator Yoshio Sakamoto approached Team Ninja to develop Other M, while D-Rockets was brought in to handle the in-game cutscenes. The development team employed a simple control scheme to make the game more intuitive and attractive, and gave significant focus on plot and characterization, with extensive usage of cinematics and voice acting. Chronologically, Other M takes place next-to-last in the Metroid universe. The events of the game take place between Super Metroid and Metroid Fusion. The story follows bounty hunter Samus Aran, who investigates a derelict space station along with a Galactic Federation platoon, which includes her commanding officer, Adam Malkovich. This page was last edited on 6 August 2017, at 01:14.